With the section on Installation, the quality begins to show through. This is a proper step by step guide with the right pictures. The Desktop section has sidebars and definitions and illustrations and works through the things you need to know in the right order; Unity, Launcher, Dash, Managing Windows, Workspaces, file manager, searching, customising, accessibility. 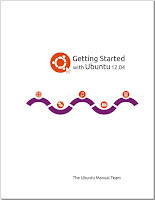 Working with Ubuntu is a comprehensive (almost 50 pages) working through the standard applications. Importantly it addresses the subject of codecs for playing different media formats. 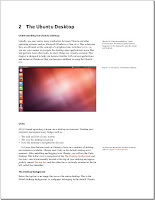 There's a section on hardware which is an area in which a lot of computer users get stuck in Driver Hell, setting up and configuring various devices. ; displays printers, cameras, sound, scanning are all covered in sufficient depth to get through common configuration. Software Management then goes through installing and maintaining the software stack on your machine, the Software Centre and the mechanics of package installs. It mentions the terminal, but doesn't go into any detail. Security is outlined as far as firewalls, permissions, users and groups goes. There's a short but sweet section on Troubleshooting. Finding Additional Help is a good list of sources. At the back, where it belongs, the Open Source Licence is included. There's also a decent glossary. Criticisms? I have very few as the Ubuntu Manual is now a mature publication. Yes, it could do with a few more pictures, if only to relieve that some of the pages are quite bland and text-heavy. The sidebar text is in far too small a typeface so you can miss some really useful snippets.